To some traditionalists the thought of using glue in the construction of a garment must seem outrageous. Well, later for you, traditionalist. This post is about the magic of glue basting. I'd never heard of instant basting adhesive before I purchased Singer Complete Photo Guide to Sewing . (Yes, I know it's not one of the cool books, but I really like it.) I was thrilled when I found a stick of this stuff in the notions department of my local fabric shop. Later research taught me that many garment sewers, quilters, and bag makers use glue basting methods in construction. I know that lots of garment sewers swear by Wonder Tape. 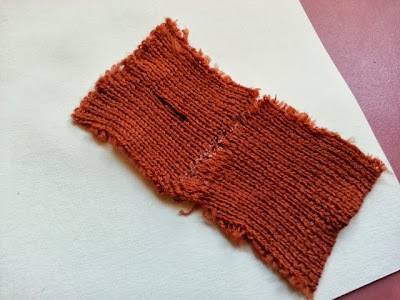 I understand that it works wonderfully well on many woven and knit fabrics. It just doesn't work at all on a sweater knit. 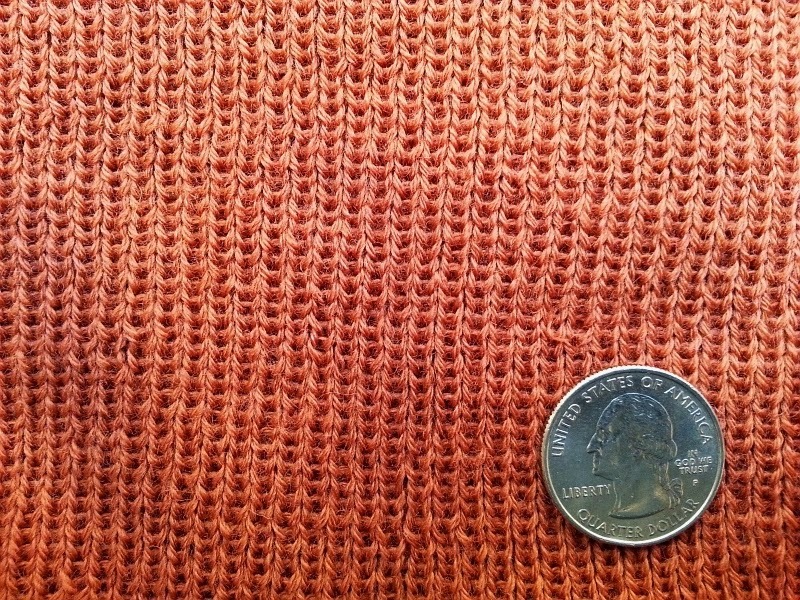 The surface of even a relatively smooth double knit does not provide enough surface for the tape to stick to. Wonder Tape can only stick to the yarns, not to the spaces between the yarns. Alas, there's not enough surface for it to stick and hold the fabric together. Yes, I could machine baste. (I do that with neck bands and other bands after pinning or clipping them to the bodice.) I could hand baste. (Done that too.) But once I tried Collins Fabric Glue Stick, I was hooked -- hooked until I heard that folks were loving Elmer's Washable School Glue with their quilting and bag making. And so I decided to conduct a little test. Basting the first pair of swatches is Elmer's Washable School Glue Stick Gel. 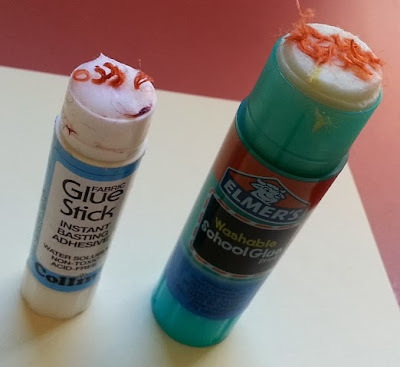 I've read of people using Elmer's Washable School Glue Stick before, but never have I heard of anyone specifically using the "Gel" version in the turquoise applicator, so I had to give it a whirl. The label says washable, though info on the Elmer's site says "permanent" and "washes out of clothes"!? This seems to be the only one in the Elmer's school glue category with the "permanent" distinction. The second pair of swatches used the highly recommended from assorted internet sources Elmer's Washable School Glue. When it's not in my handy fine line applicator, pictured above, it comes in the familiar plastic bottle, pictured below. Number three was Collins Fabric Glue Stick - Instant Basting Adhesive. This is the stuff I've been using regularly. Glue basting the fourth set of swatches was the Stitch Witchery brand of Fusible Bonding Web. The info on the Dritz site states that this product is for "fuse-basting". This is what happens to the glue sticks when working with unfinished edges. I know from previous work with the Collins Glue Stick, that this won't happen on finished sweater knit edges. I don't consider the mess a huge problem. The Elmer's Washable School Glue Stick Gel really was permanent and left a residue! I could not pull the pieces apart after washing and drying. All other glues washed away easily and swatches separated from each other in the wash. As I understand it, the Elmer's Washable School Glue Stick Gel is not the same as the Elmer's Washable All Purpose School Glue Sticks, which some people seem to use successfully. Yeah, I know, confusing. 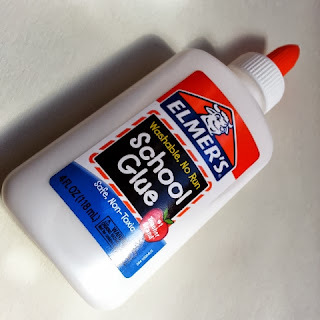 In conclusion, I'll be basting mostly with #2, the Elmer's Washable School Glue (liquid) from now on, because it's so easy to use. 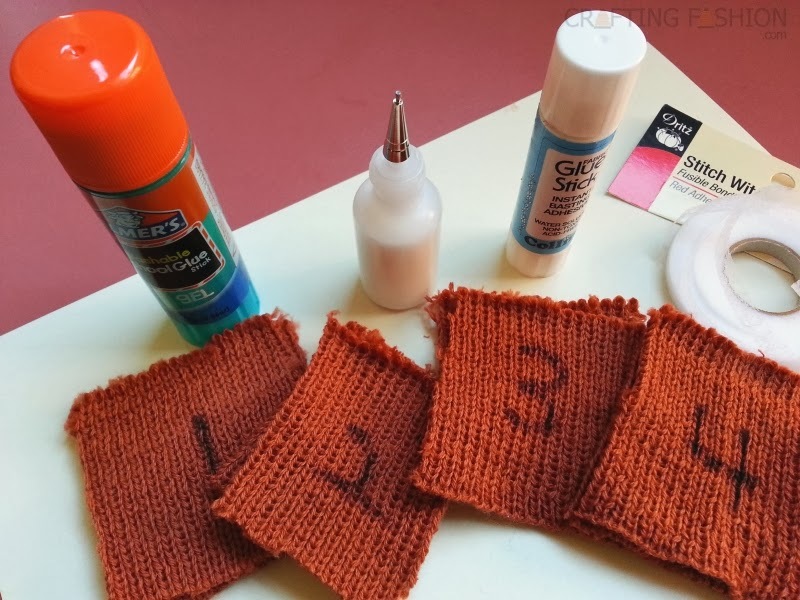 With a sweater knit fabric, it does not dry as quickly as the Collins instant basting adhesive, but it's so easy and not messy. Did I mention it was easy? I'll use the Collins glue stick on my already finished edges. As for the Elmer's Glue Stick Gel in the turquoise container? It's my new favorite glue for cataloging swatches, when I glue a new design to paper and I want it to hold forever. Any glue basting experience you'd like to share? I'd love to hear about it. Very interesting! I've recently started using glue to baste my hems when I sew with regular knit fabrics, before twin stitching. It helps prevent the ridge between the two lines. I've just been using regular UHU but plan to get proper fabric glue! I'm not sure if these brands are available in Australia, but it's a very interesting comparison, thanks! I am also a fan of UHU glue. Both the liquid and the sticks. I like it because you can thin it with water, it sticks like heck and it is easily purchased. [I live in the boonies on a farm]. I never thought to put some in my fine-liner squeeze bottle though and you bet I'll be doing that soon. In the past I've used liquid UHU thinned up to 50% with water and a paint brush to apply to fabric and thin papers [tissue paper, mulberry paper] but I'm thinking it would be even easier in the thin line bottle. Thanks again for posting your results!